E.O. Gas Pre-Sterilized , Independent Blister Packing Order Details: Sample order , Trial order , OEM are welcome. Delivery Terms: DHL , UPS , Fedex , TNT , EMS , ChinaAir , Ship. Payment Terms: Paypal,Western Union,Bank Transfer. General delivery time: 1-3 days . 5. 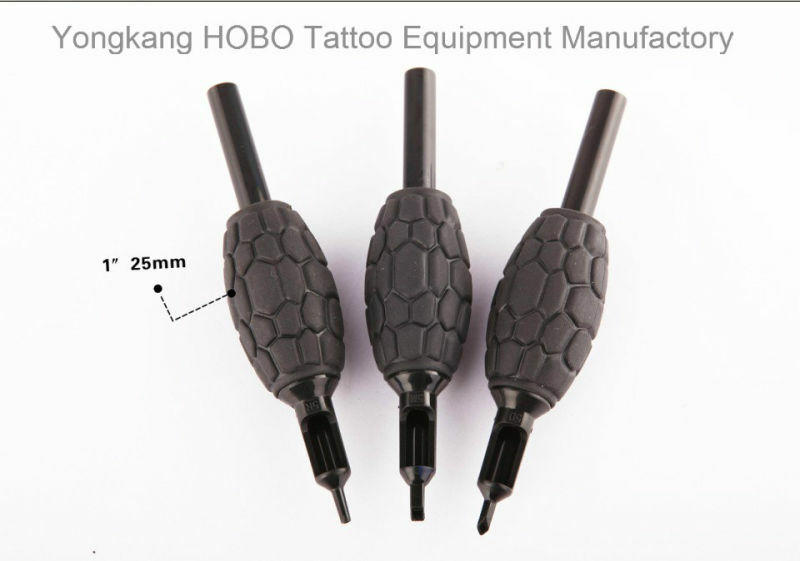 Company InformationYongkang Dongcheng HOBO Tattoo Equipment Manufactory specializes in producing and selling tattoo equipment, disposable tattoo grips,stainless steel tattoo grips, Tattoo Tips ,pre-made Tattoo Needles, tattoo machines, rotary tattoo machines, Tattoo Kits ,Tattoo Power supplies,Piercing Tools and Tattoo Accessories. We are looking for tattoo wholesalers from all over the world. We can supply high quality products at competitive prices and provide excellent after-sales services. Please feel free to contact us if you are interested in our products or company. We will extend our warm welcome to our customers, old and new, to enter into business cooperation to jointly build a brilliant future. 6. Why Choose Us ?Our Service First, we have been in tattoo field as a factory for more than 8 years,6 years as a Alibaba gold member. We are a reliable business.We can supply complete tattoo products as you need. Sample order , Trial order , OEM are welcome. Second,we can guarantee the quality of the goods.We are committed to make high quality but low price products.We are unceasing develop the new styles.We have the Certificate of Design Patent on tattoo grips and machines. Most of the styles we have the exclusive right of production in China! Third,the delivery time is short,such as the disposable ones,we can supply 20000 pcs a day.So that it will save you time to get the products.General delivery time: 1-3 days. Fourth,our free samples available to send to you for checking quality before placing an order. 7. FAQQ: Do you require Minimum Order Quantity(MOQ)? A: We don't require on quantities. But We'll offer you a wholesale price if you buy in bulk quantity. Q: I want to make logo on the boxes, is that possible? A: Yes,we accept customizing boxes and blister,the minimum quantity for the custom made boxes is 2000 pieces,price for blister is free. Q: Can I get a free sample? A: Our free samples available to send to you for your check first before you have a real order.You just need afford the shipping cost of samples. Q: How many days can I get the package after ordering? A: Normally you will receive the goods within 7 days if the goods were shipped via express(DHL, FedEx, UPS, TNT, EMS,etc). If by the fastest way,only need 3days to get it.It will take longer if by SEA TRANSPORTATION (For bulk orders). Q: How can I pay? A: We accept PayPal, Western Union,T/T payment term. Contact us if you need more details on Disposable Tattoo Tube. We are ready to answer your questions on packaging, logistics, certification or any other aspects about Tattoo Tube、25mm Tattoo Tube. If these products fail to match your need, please contact us and we would like to provide relevant information.